Dingoes work very hard to raise their young; each member of the pack helps to feed and nurture the pups. With their gregarious, playful manner, dingo pups enjoy spending time with people, as they have done for thousands of years. Dingo pups are the future of the K’Gari species and need to be protected at all costs. 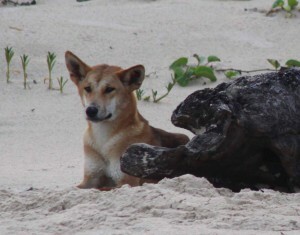 Easter on K’Gari is a sad time for dingo families. Pups are nine months old and are very curious about the many tourists that have suddenly appeared on their beach. 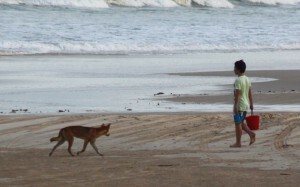 The beach is their territorial boundary, and as such they patrol it several times a day. When pups venture onto the beach they walk between the dunes and the tide line looking for food. At dawn and dusk they become very excitable and run around and play games with each other. How humans act while this is happening determines whether these pups live or die. If you see pups on the beach, DO NOT PANIC. They are not there to attack you. Remain calm, stay close to your children at all times. DO NOT RUN. DO NOT WAVE YOUR ARMS AROUND. STAND STILL. When people do not panic, dingoes do not panic. If you ignore the dingo, it will eventually walk away. 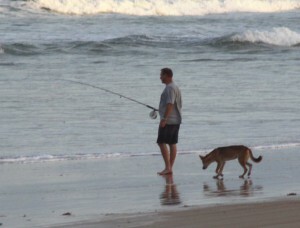 Dingoes may try and get your bait or your fish. Make sure your bait bucket has a lid, or put your fish and bait in your car. Please see the photos for what happens when people remain calm. These photos were taken on April 2, 2011. The next week there were twice as many people on the beach. During Easter/Christmas holidays the beach is full of people. Imagine how confusing this can be for these pups, who have not seen this many people before. For Good detailed photos of the Eurong pups, please see face book page: Judith Doris Daniel. There are only three pups left at this stage. Let’s hope that after Easter there are still three pups left. Please help save our dingoes this Easter. If Easter is a bad time, how did the September holidays go? I had friends that went to Fraser and said it was very busy. I hope no dingoes got killed. I have not observed dingoes cleaning their feet as you described, but have observed them rushing through narrow holes. The advantage that dingoes have is that the widest part of their body is their cheekbones, so they know that if their head will get through a space the rest of them will. Of course, your red -heeler cross will have a great deal of dingo in her, and sometimes I am surprised at how dingo like they look and behave. 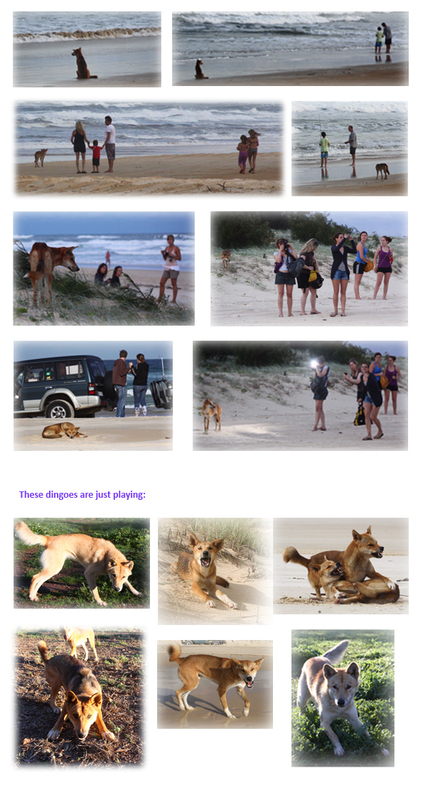 Dingoes also love nipping,, which is why they get into such trouble on Fraser Island,. My K9 does the same thing. All canids love running around in circles around you! On Fraser Island it is called dominance testing! But we know it is purely play behaviour. It’s great to watch animal behaviour, and I can see you clearly understand what your dog is doing. I have a red heeler cross that looks very dingo-like. She has very different behaviour to other dogs I have known and owned (vet nurse for 40 years). She cleans her feet every night as a ritual after dinner, while in her bed. You can hear her clean each toenail by grasping it in her teeth and strippig it towards the end which makes a distinctive noise. She will rush with amazing speed into any narrow dark space under the house or into a tree cavity without any injury, like an arrow. She also has other quirky habits like nipping when you get down near her head and then she runs in wide circles with great excitement. 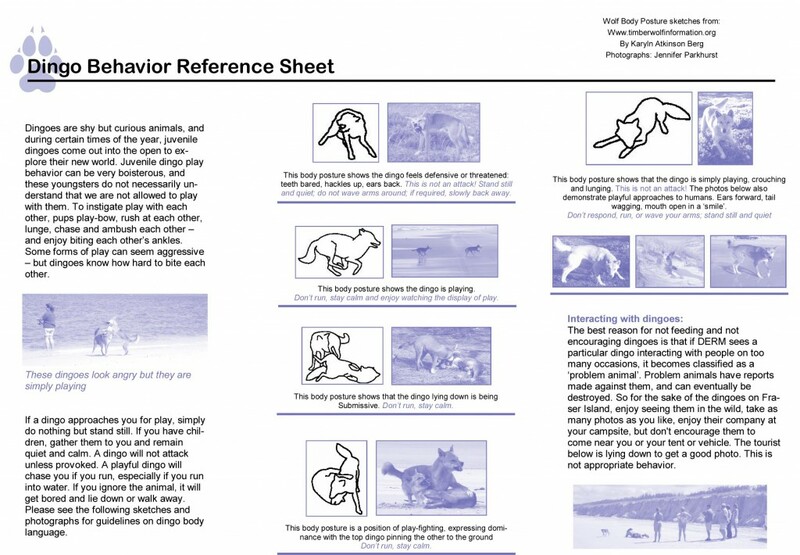 I would like to know if you have observed any of these habits in dingoes. I certainly would like to visit Fraser Island for a leisurely few days without having to see starving, emaciated dingoes lying around listlessly begging for food. If I could be sure that this was the case, this would be a great holiday destination for me. At the moment I am planning a trip to the USA to see the Grand Canyon and some of the National Parks on the west coast, but I would prefer to spend my dollars in my own country. Let’s share this to encourage compulsory reading. It is really common sense for people who have any kind of compassion, intuition and sensitivity for humanity including any living beings. Dogs in council parks behave much worse than this; I had a mother dog who would run and bark at people in parks protecting her pups and people who do not have dogs would freak out, they do not understand. If you are not prepared to understand dog behaviour best avoid areas where dogs live or are allowed unleashed. This page should be compulsory reading for all tourists intending to visit Fraser Island. Extremely well written and professional. It is SO much better than DERM’s fear-mongering propaganda. 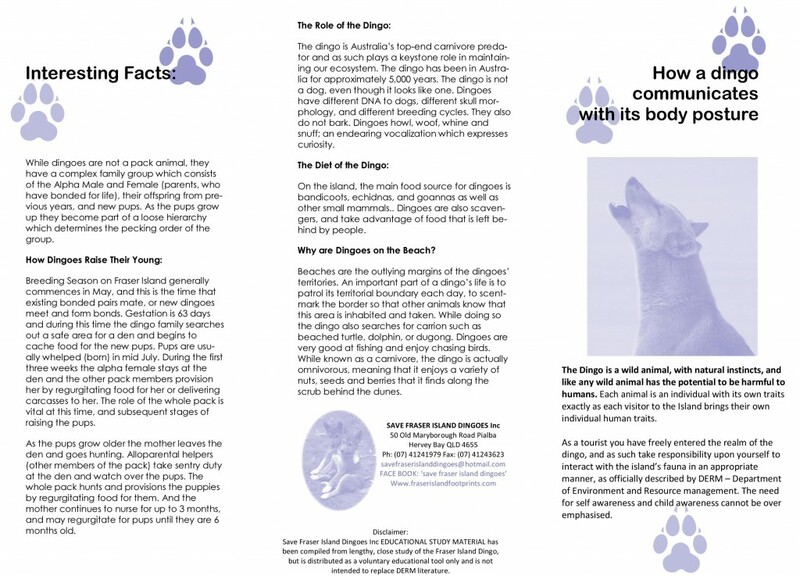 It is clearly important to inform tourists about the different aspects of dingo behaviour, so that not every movement made by a dingo will be perceived as threatening. Some of DERM’s signage is an absolute disgrace, being vaguely worded so as to cause unnecessary alarm and panic. A classic example is the sign that says “If threatened defend yourself aggressively”. Most visitors are left perplexed or frightened by this sign, imagining they are being stalked by ferocious dogs and also wondering “with what?” are they supposed to defend themselves. Some tourists are likely to report an individual dingo as “troublesome” simply because it looked sideways at them. This page is a breath of fresh air and should definitely be made widely available. Well done!! I accept it would be a big expense, but how effective would it be if SFID & other groups produced a short sharp leaflet & volunteers handed them out to every single tourist that gets off the ferry? Nic & I produced 3 different leaflets, each with 5 or 6 points on them, printing cost $250, whenever we are out with Lindy we distribute them. The response has been amazing…. 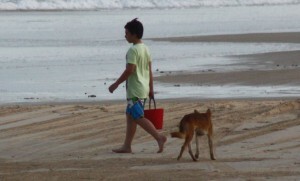 Now is the time to see more Rangers and dingo supporters on the beach to make sure the Tourists behave themselves around dingoes. But the sad thing is , 1000′s of tourists will be invading the dingoes territory and the 6 mth old pups just wont know what to do. There will be 100′s of 4WD’s racing down the beach, and the pups have no ” road sense ” at all, how could they? I know some of the DERM people would prefer reduced Tourist numbers on the Island, but the Govt wont do it as Fraser Island is a big cash cow for them. Let’s hope these pups survive the Easter Invasion. Where are their parents and siblings? already victims of too much tourism. 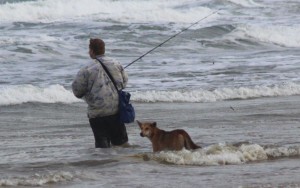 It would be helpful to see rangers on the beach advising tourists of correct behaviour rather than disguised in plain clothes trying to catch people throwing the pups the odd fish..